Foreigners can indeed buy stocks and shares in both the Chinese mainland and Hong Kong, although it’s not always as straightforward as it might be for them back home. The Chinese stock market is divided into three kinds of shares: A Shares, which are restricted to Chinese citizens and Qualified Foreign Institutional Investors; B Shares, which are open to all foreigners, and H Shares, which are Hong-Kong-based shares and also open to foreign investment. 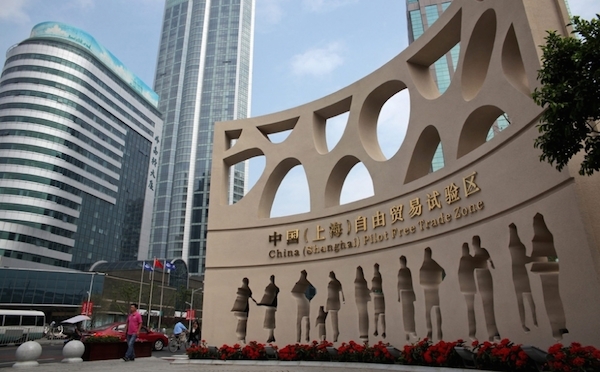 In order to trade in A Shares, which are bought and sold in RMB, foreign companies must first get a bank to submit a Qualified Foreign Institutional Investor application form to the China Securities Regulatory Commission (in order to get a permit allowing them to invest in RMB) and also submit an Investment Quota Application to the State Administration of Foreign Exchange. Once these have both been done, the company can then approach a Chinese securities company to make the investment. However, there is a high threshold for entry: the company must own at least $500 million (for insurance companies, asset management companies etc) or $5 billion (for foreign securities firms and banks). 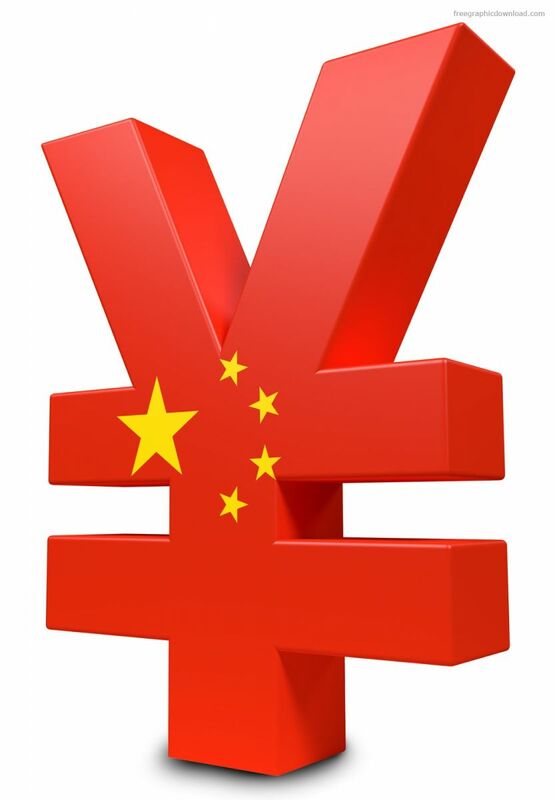 The B Shares use US dollars or HK dollars as denominations and are issued by Chinese companies listed in the Chinese mainland – although ironically they cannot be bought by Chinese citizens. If you want to trade in these shares, take your passport and residence permit to a securities firm to open a B Share account. You will need to deposit at least $1,000. H Shares are bought in HK dollars, and are issued by Chinese companies listed in Hong Kong. In order to invest in these shares, you must go to Hong Kong and open an investment account in a HK bank, putting in at least 10,000 HK dollars. The account can be opened with your HK visa, your passport and your Chinese mainland residence permit. You must go to Hong Kong in person to open the account, but then you can return to the mainland to make deals online. It is open to anyone, foreign or Chinese. Foreigners can also buy funds and bonds in China from commercial banks, securities firms and other sales agencies, by opening a fund or bond account at said agencies. To ensure that the bank or securities firm you are opening an account with is trustworthy, make sure that they have the qualifications necessary for trading. You can do so on the website of the China Securities Regulatory Commission (CSRC; no English version). If you are signing up to a securities firm online, make sure that the website is legitimate and not a clone or fake. Genuine securities firms do not promise profits or returns, and they will sign printed consulting contracts with you if you use their services. In addition, they are only allowed to receive money via company or business accounts, not personal accounts. It is advised to check whether an agency or broker has the qualifications necessary to sell securities, also at the China Securities Regulatory Commission website. Do not trust anyone who claims to have insider information on stock market trading. Do not trust anyone – even a so-called expert – who claims to be able to give precise predictions of the stock market. Likewise, don’t trust trading software that claims to be able to predict the stock market’s movements. 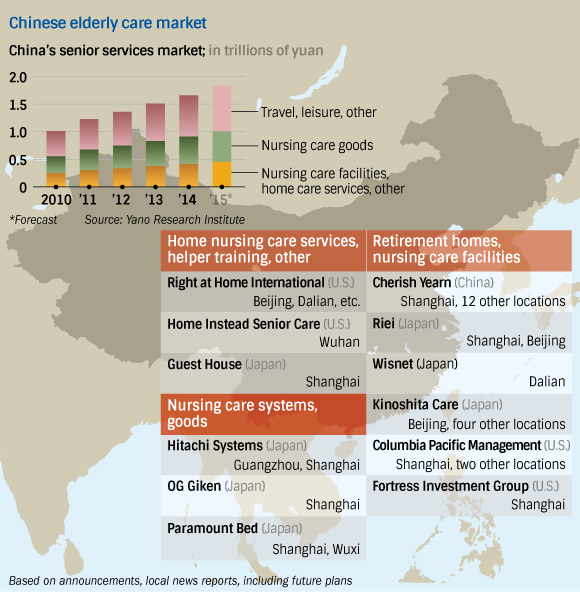 With a projected 636 million people over age 50 by 2050, or nearly 49 percent of the population (up from 25 percent in 2013) the government is now seriously looking at expanding care home facilities in China (there are currently estimated to be just under 3 million care home beds across the country). With the development of the economy, people's ideas on care-giving for the elderly are changing: A Chinese proverb calls filial piety, or respect for one's parents, "the first among 100 virtues. However many families have now moved away from traditional ideas of taking care of the elderly at home, especially in the larger cities and prefer well-equipped nursing homes. With this in mind the government is now courting investment into the sector with a new law pertaining to foreign investment in Care Institutions. Article 1 Encourage foreign investors to establish for-profit elderly care institutions in China independently or with Chinese companies, enterprises and other economic organizations in a joint venture or cooperative way. Article 2 The foreign-invested for-profit elderly care institutions shall abide by relevant laws, rules and regulations, aim at providing social services, pay tax in accordance with the law and operate in compliance. Their legal operating activities and their contributors' legitimate rights and interests are under the protection of law. 7. Other materials required to be provided according to the laws, rules and regulations. Article 4 A competent department of commerce at the provincial level shall make a written decision on approval or disapproval within 20 days upon its acceptance of the application concerned. Where the application is approved, the foreign investor concerned shall be awarded the Approval Certificate of Foreign-invested Enterprise, with words as "operate under the Permit for Establishment of Elderly Care Institutions" added in the column of business scope; where the application is disapproved, reasons therefor shall be told. Article 5 A foreign investor shall handle the formalities for registration of foreign-invested enterprises within one month upon receipt of the Approval Certificate of Foreign-invested Enterprise with the administration for industry and commerce concerned. Article 6 After the registration, the foreign-invested enterprise shall apply for and obtain the Permit for Establishment of Elderly Care Institutions in accordance with relevant provisions of the Measures forPermitting the Establishment of Elderly Care Institutions. No foreign-invested for-profit elderly care institutions or foreign investors shall provide elderly care service or charge fees or admit the elders in any name before obtaining the said permit and being approved for registration in accordance with the law. Article 7 Foreign investors are encouraged to participate in the transformation into the enterprises from the institutions of public elderly care specifically providing for-profit services to the society. 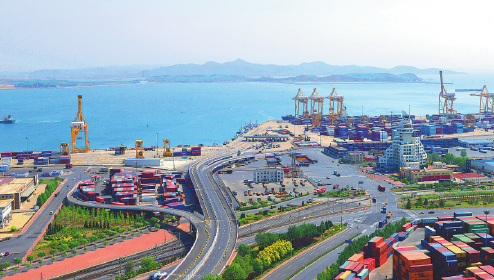 During the transformation, issues such as the protection of employees' interests and the value maintenance and appreciation of state-owned assets shall be handled properly. Article 8 Foreign-invested for-profit elderly care institutions can engage in domestic investments relating to the elderly care service. Foreign investors are encouraged to develop the elderly care institutions on a grand scale, operate the same in a chain mode and develop quality brands of elderly care institutions. Article 9 Foreign-invested for-profit elderly care institutions enjoy the same preferential tax policies and policies on reduction and exemption of administrative and institutional fees as those available to domestic-invested for-profit elderly care institutions. Article 10 The application for establishing foreign-invested real estate enterprises that are set up through changing such usage conditions as the land use or the plot ratio of the land for construction of elderly care facilities shall not be approved. Foreign-invested for-profit elderly care institutions shall not engage in business such as residential discount for elderly care. Article 11 Where the business scope of a foreign-invested for-profit elderly care institution includes the medical and health service, such institution shall handle the formalities for submission for approval in accordance with relevant policies. Article 12 The competent departments of commerce at the provincial level shall strengthen the statistical work concerning foreign-invested for-profit elderly care institutions, and when issuing the certificate for approval, choose "Elderly and Disability Service"(Paragraph 8414 of National Economic Industrial Classification) in terms of the category of industry. Article 13 Foreign-invested for-profit elderly care institutions established in accordance with the Announcement shall participate in the joint annual report of foreign-invested enterprises on time. Article 14 The Announcement applies mutatis mutandis to the establishment of for-profit elderly care institutions by investors from Hong Kong Special Administrative Region, Macao Special Administrative Region and Taiwan Region. In case of any inconsistence between former provisions and the Announcement, the Announcement shall prevail. Article 15 If the local competent departments of commerce and civil affairs encounter with any problems, please feel free to contact the Ministry of Commerce and the Ministry of Civil Affairs in a timely manner.